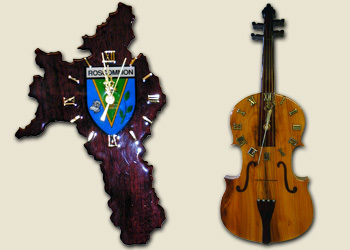 Our exquisitely designed clocks, symbolic of Irish culture are handcrafted by Thomas Noone from solid timbers at Derrycashel and finished with a Polymer Coating. They are then fitted with a Quartz Movement which runs on AA size batteries. Custom designs made to order. View our Craft Selection or Contact Us. Postal Order and Bank Drafts accepted.